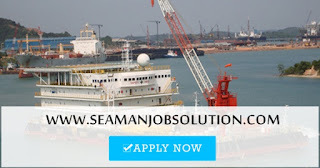 SEAMAN JOB INFO - E.B. Aznar Shipping Corporation opening seaman career for Filipino crew joining onboard A.S.A.P. For interested applicants, please send your application via email at pasaporteemilydianne@gmail.com or visit our office at 2/F Manoling Bldg., V. Gullas St. Brgy. San Roque, Cebu City (white bldg with ultramart across CTU Main) Tel. +63 32 238 0042. 0 Response to "Ordinary Seaman (6x), Bosun (1x), Master (2x)"